Most businesses reach a point where they have to decide if they should invest in a social media management tool. Typically this is once they are active on a of couple networks and are beginning to become overwhelmed by the complexity of managing them. Does this sound familiar? If so, then you are in the right place. A social media management tool can be a serious investment depending on your budget, so let’s look at some of the main reasons why a social media management tool is worth investing in. As stated above, managing your social media accounts can become complex very quickly as you begin to grow your presence on multiple networks. Multiple logins to remember, different user interfaces to master. On top of that, social networks were built first and foremost for consumers. As a business, none of these things make your life easier. That is where a dedicated social media management tool comes in handy. It allows you to consolidate down to one login, a unified user interface and is packed with business focused features. Put simply, it is how businesses were meant to manage social media. If you miss a notification from your best friend on Instagram telling you to check out a funny cat video, chances are the world won’t end. However, if you miss an important message or mention from a customer it could result in a loss of money, relationships, etc. 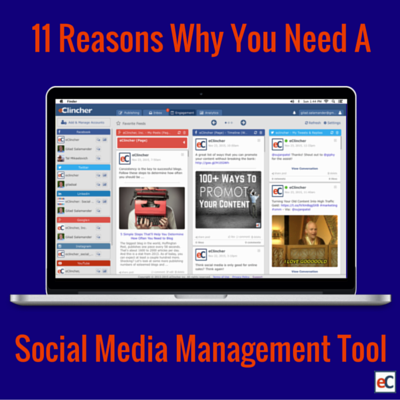 A good social media management tool will make it nearly impossible for you to miss an important notification. For example, eClincher has a Unified Social inbox that aggregates all of your messages and notifications in one place. On top of that, it allows you to mark items as completed, tag them for later reference and search by keyword. This combination makes it hard to miss anything important, which is great news for you and your business. As any social media manager could tell you, socializing is important. The word “social” is in the name for goodness sake. Unfortunately, they can also probably tell you how hard it is to remember every conversation they have had. Introduce multiple social networks into the equation and finding old conversations in a timely manner becomes nearly impossible. A social media management tool will make it much easier for you to keep track of all your conversations. To begin with, all of your data is in one place, this already makes your job easier. Some tools also allow you to search for conversations by keyword, which may make you feel like you have social media superpowers. By remembering even one word or name from the conversation, you will be able to find it with ease. Not bad, huh? Marketers that have a documented social media marketing strategy and an editorial calendar are far more likely to succeed than those that don’t. Seems like common sense, right? You would probably find it surprising then that only 32% of marketers have a documented strategy. Documenting the goals you hope to achieve is crucial, as well as the type of content needed to reach them. By planning ahead you can ensure you post the type of content necessary to reach your goals and grow your business. 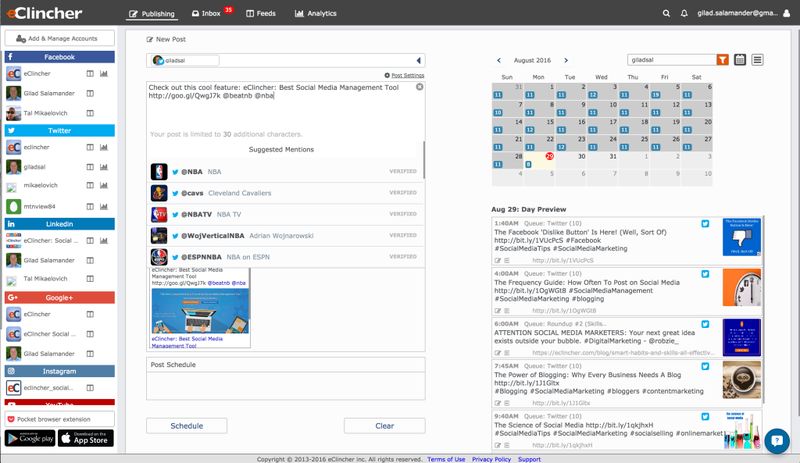 A social media management tool will allow you to schedule social media posts ahead of time. This will make it much easier to visualize what you will be posting and align it with your goals. Oh, and scheduling posts sure beats having to post everything manually. Without the help of a tool it is impossible to keep up with the 24/7 nature of social media. Social Media Today’s Andrew Hutchinson recently said that the greatest benefit of social media is data. This data gives businesses insight that they could have only dreamed about 20 years ago. Consumer opinions, feedback, competitor information and much more. All of this information is out there, but finding it is easier said than done. Luckily, social media management tools can help. Many tools offer a dedicated place to search for this information. Though you can find the same information by using the network itself, tools simplify the process while allowing you to save your searches for quick access any time. Wondering what you should be looking for and how to find it? Learn more here. As a marketer you should always be looking for ways to improve. A great way to do this is through trial and error. By testing different types of content, formats, timing, etc. you can begin to learn what your audience likes. Well, only if you can measure what is and is not working. That is where a social media management tool comes into play. Most social media management tools offer access to analytic data. This data may be how many retweets a posts received, how many website visitors your social channels referred or the cost per click of your recent paid campaign. Understanding what these numbers mean and adjusting accordingly is crucial. The cycle to social media optimization is simple: test, tweak, optimize. The analytics provided will help you to improve your efficiency as a marketer, but they will also help you justify your investment in social media marketing. Though you probably see the benefits of social media for businesses, your boss or superiors may not. This is typically due to the belief that social media doesn’t increase the bottom line. If you want to have support for the long haul, you are going to have to prove the return on investment (ROI) of your actions. With a good social media tool you can quickly show key performance indicators (KPIs) to prove that your actions are improving the bottom line, while also increasing brand awareness, encouraging two way communication and building thought leadership. If there is one thing all businesses need to do more on social media it is engaging in conversations. Most businesses do a decent job of “remaining active” on social media, which often times means that they post a certain number of times everyday. Consistent posting is important, but so is the spontaneous engagement. The unplanned conversation you jump into or the question you help answer. In a world of automation, this type of engagement is becoming more rare. You might be wondering, how does an automation tool help me be less automated? The answer is simple: through the automation of certain tasks, you give your business more time to engage in real-time. We highly encourage you to use this time to connect with new people, engage in conversations and answer people’s questions. As you can see, images are very popular, so why is it that so many businesses aren’t creating custom images that will help build brand awareness, encourage shares and convey their message more effectively? It could be that they don’t have the expertise required. Or so they think. Tools like Canva and PicMonkey remove nearly all barriers to creating stunning images that people won’t be able to resist sharing. What is even better than static pictures,? Ones that move (animated GIFs). A tool like Giphy gives you access to millions of animated GIFs for free. Seeing how important visuals are on social media, we decided to add Canva and Giphy to our tool. Now you can quickly create or find visuals to take your posts to the next level. Content is what fuels social media. Whether it is a cute video of a puppy or a blog post discussing how social media benefits businesses, content is what makes social media go. As a business, creating enough content to keep your networks active is hard. In fact, Smart Insights found in a recent study that producing engaging content, producing content consistently and producing a variety of content were three of the top five challenges marketers faced in 2014. Creating your own content is necessary, but so is curating content from others. What this means is that you are finding content created by other people/businesses to share on your social networks. This helps to reduce the amount of content you have to create and also gives you a wider variety of content topics to share. Though curated content won’t drive traffic to your site or sales directly, there are serious benefits to being the go to resource for valuable information. Just think about Google. Most social media management tools have built in content curation capabilities. This could be as simple as RSS feeds to give you quick access to relevant articles, or more advanced like integration with a curator tool like Feedly. Being able to find and share the best content will always be important, so look for a social media management tool that can make the process more streamlined. Having a consistent brand identity on social media is crucial. It allows current and potential customers to have a seamless experience regardless which network they are on. Having a tool that keeps all of your accounts and information organized makes achieving consistency obtainable. This consistency could be your business’s “voice”, the colors included in your visuals or how often you post. With a dedicated place to monitor all of these things, consistency is possible. Think about a successful business/person you follow on various social networks. Are you ever able to know a post is theirs just because of the colors or time of day it was published? One person that comes to mind for us is Rebekah Radice. Her use of orange and the same fonts across her different social accounts makes it easy to spot one of her posts amongst the crowd. This is possible thanks to her commitment to portraying a unified identity and message across her different social accounts. If you want your business to stand out in a good way, consistency is key and a social media management tool will help. Interested in seeing how a social media management tool can help you grow your business on social media? Take advantage of a 14 day free trial of eClincher today!